At Little Duck Organics, we are committed to making clean, healthy foods for the whole family. We create snacks packed with vitamins and nutrients that are delicious and fun to eat. 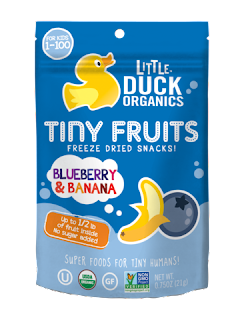 Making simple, healthy snacks is a big job for Little Duck! 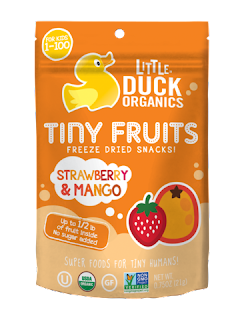 Little Duck Organics began with a simple goal: to give our own kids a clean, healthy alternative to typical snack food. We started with some classics, fruits and veggies, and well, our search ended pretty quickly. We found that freeze-drying 100% organic super-foods like bananas, goji and pomegranate created a fun snack that was really healthy. As it turns out, freeze-drying locks in all of the vitamins and nutrients in fruits and veggies. Mission accomplished! Our kids loved the Tiny Fruits and soon their friends did, too. It wasn’t long before everyone we knew--kids and adults--wanted our snacks. We realized we were on to something much bigger than Tiny Fruits...our delicious and healthy snacks needed to be shared with the whole world! Just like that, Little Duck Organics was born. Over the years, our product line has expanded from Tiny Fruits to a whole bunch of other tasty snacks, like Tiny Gummies and Tiny Yogurts. Even as we’ve grown, our mission hasn’t changed. All of our products are USDA Certified Organic, Project Non-GMO Verified, gluten free and kosher because real, clean ingredients matter. 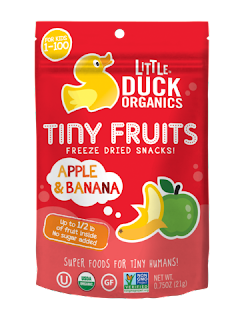 Little Duck Organics is still committed to making simple, healthy snacks for everyone, big and small. 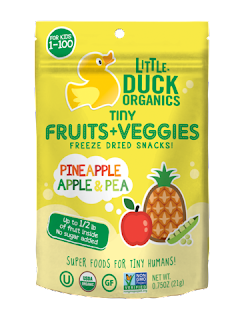 We hope you enjoy Little Duck Organics as much as we do. Happy snacking! Our Banana, Mango & Edamame Tiny Fruits + Veggies pouch is filled with up to a whopping half-pound of organic bananas, mangos and edamame! The fruits and veggies are diced and water is freeze-zapped out. What you get are vitamin and nutrient-dense, freeze dried fruit and veggie snacks. NO added sugar, NO preservatives, NOthing but the best! Tiny Fruits + Veggies are USDA Certified Organic, Project Non-GMO verified, gluten-free, kosher, dairy free and nut free. Superfoods for super humans, big and small! Our Pineapple, Apple & Pea Tiny Fruits + Veggies pouch is filled with up to a whopping half-pound of organic pineapples, apples and peas! The fruits and veggies are diced and water is freeze-zapped out. What you get are vitamin and nutrient-dense, freeze dried fruit and veggie snacks. NO added sugar, NO preservatives, NOthing but the best! Our Apple & Banana Tiny Fruits pouch is filled with up to a whopping half-pound of organic apples and bananas! The fruits are diced and water is freeze-zapped out. What you get are vitamin and nutrient-dense, freeze dried fruit snacks. NO added sugar, NO preservatives, NOthing but the best! Our Apple & Mango Tiny Fruits pouch is filled with up to a whopping half-pound of organic apples and mangos! The fruits are diced and water is freeze-zapped out. What you get are vitamin and nutrient-dense, freeze dried fruit snacks. NO added sugar, NO preservatives, NOthing but the best! Our Blueberry & Banana Tiny Fruits pouch is filled with up to a whopping half-pound of organic blueberries and bananas! The fruits are diced and water is freeze-zapped out. What you get are vitamin and nutrient-dense, freeze dried fruit snacks. NO added sugar, NO preservatives, NOthing but the best! Our Strawberry & Mango Tiny Fruits pouch is filled with up to a whopping half-pound of organic strawberries and mangos! The fruits are diced and water is freeze-zapped out. What you get are vitamin and nutrient-dense, freeze dried fruit snacks. NO added sugar, NO preservatives, NOthing but the best! 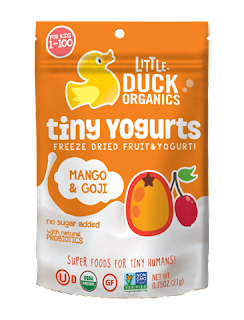 Our Mango & Goji Tiny Yogurts pouch is filled with 100% organic mangos, goji and yogurt. Each bite contains the full antioxidant power of fresh superfruits, B-vitamins and Iron. Add in naturally occurring probiotics, and you’ve got a delicious snack that’s nothin’ but yummy for the tummy! NO added sugar, NO preservatives, NOthing but the best! Tiny Yogurts are USDA Certified Organic, Project Non-GMO verified, gluten-free, kosher and nut free. Superfoods for super humans, big and small! Our Pomegranate & Acai Tiny Yogurts pouch is filled with 100% organic pomegranates, acai and yogurt. Each bite contains the full antioxidant power of fresh superfruits, B-vitamins and Iron. Add in naturally occurring probiotics, and you’ve got a delicious snack that’s nothin’ but yummy for the tummy! NO added sugar, NO preservatives, NOthing but the best! 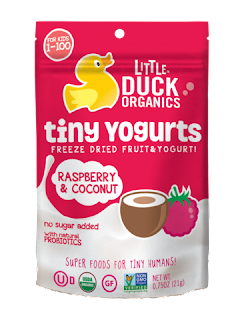 Our Raspberry & Coconut Tiny Yogurts pouch is filled with 100% organic raspberries, coconut and yogurt. Each bite contains the full antioxidant power of fresh superfruits, B-vitamins and Iron. Add in naturally occurring probiotics, and you’ve got a delicious snack that’s nothin’ but yummy for the tummy! NO added sugar, NO preservatives, NOthing but the best! 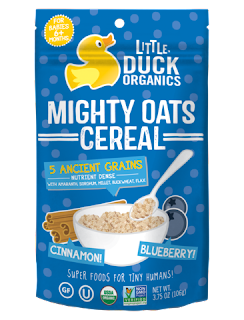 Our Blueberry & Cinnamon Mighty Oats are a hearty blend of ancient grains containing quinoa, chia, buckwheat, oat and millet. Nutrient-rich and containing no added sugar or nasty chemicals, our Mighty Oats are a nutritional powerhouse providing vitamins, minerals, fiber, protein, Omega-3’s, antioxidants and even phytochemicals. NO added sugar, NO preservatives, NOthing but the best! Mighty Oats are best accompanied by water, milk or formula. 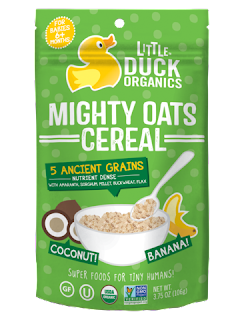 Mighty Oats are USDA Certified Organic, Project Non-GMO verified, gluten-free, kosher, dairy free and nut free. Superfoods for super humans, big and small! Our Naked Mighty Oats are a hearty blend of ancient grains containing quinoa, chia, buckwheat, oat and millet. Nutrient-rich and containing no added sugar or nasty chemicals, our Mighty Oats are a nutritional powerhouse providing vitamins, minerals, fiber, protein, Omega-3’s, antioxidants and even phytochemicals. NO added sugar, NO preservatives, NOthing but the best! Our Coconut & Banana Mighty Oats are a hearty blend of ancient grains containing quinoa, chia, buckwheat, oat and millet. Nutrient-rich and containing no added sugar or nasty chemicals, our Mighty Oats are a nutritional powerhouse providing vitamins, minerals, fiber, protein, Omega-3’s, antioxidants and even phytochemicals. NO added sugar, NO preservatives, NOthing but the best! 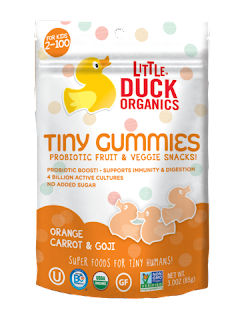 Our duck-shaped Orange, Carrot & Goji Tiny Gummies are made from the highest quality 100% fruit purees and are both a superfood and a super probiotic. Each serving has 1 billion cultures to help support immunity as well as antioxidants, iron and vitamin C. NO added sugar, NO preservatives, NOthing but the best! Tiny Gummies are USDA Certified Organic, Project Non-GMO verified, gluten-free, kosher, dairy free and nut free. Superfoods for super humans, big and small! Our duck-shaped Pomegranate, Blueberry & Acai Tiny Gummies are made from the highest quality 100% fruit purees and are both a superfood and a super probiotic. Each serving has 1 billion cultures to help support immunity as well as antioxidants, iron and vitamin C. NO added sugar, NO preservatives, NOthing but the best! 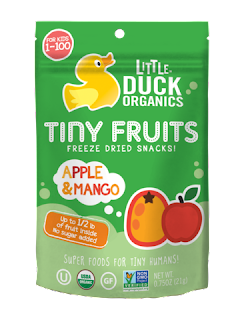 Little Duck Organics are the perfect snack for little ones! I love that all their products are USDA Certified Organic, Project Non-GMO verified, gluten-free, kosher, dairy free and nut free. I also love that they have no added sugar or preservatives. They are all natural just as nature intended food to be. 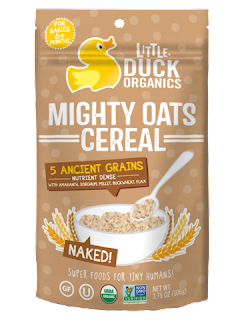 I feel confident that I'm feeding my kids the best when they eat Little Duck Organics! These are wonderful products and contain nothing but the best ingredients. My kids loved all of these products and even ate the veggies in the Fruit and Veggies pack. The Tiny Gummies taste so good and even I had a hard time staying out of them. I also love that the Tiny Gummies contain superfood and a super probiotic. The Tiny Yogurts and Mighty Oats Cereal were also loved in my household and worked great as a healthy breakfast. I highly recommend Little Duck Organics brand! Click HERE to locate a store near you that sells Little Duck Organics! Follow Little Duck Organics on social media! Wow I have never heard of this brand but I love how many varieties they offer of fruit snacks. My kids love fruit snacks and they would be perfect for them to take to school. Those flavors all sound wonderful! They're much more exciting than standard fruit flavors. The fact that they have no preservatives is a big plus. Great ingredients and fantastic packaging! I love the looks of these cute snacks and the healthiness of them. The flavors make me wonder if I might love them too! I'm a little scared of freeze dried snacks but these look pretty good! 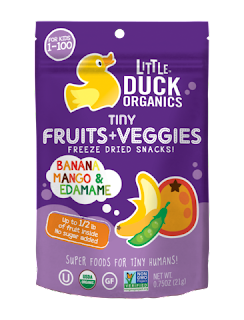 I'd never heard of Little Duck Organics but these sound really yummy! May try these out and get some next time we're at the store. This is a new company to me. But they sound really good. Lots of different flavors and ingredients to choose from. those look awesome. i'll have to check them out soon.